We have had two users (1 (10K only), 2) over the past 24 hours that tried to convince the meta crowd that there was an issue with posting their question. Both of them failed to define a clear enough description to make this reproducible or even diagnose. However, both cases are probably caused by the new tag warning logic. The AJAX call to /post/new-tags-warning returns a warning and content but the popup with that content is never shown to the user in a specific case. 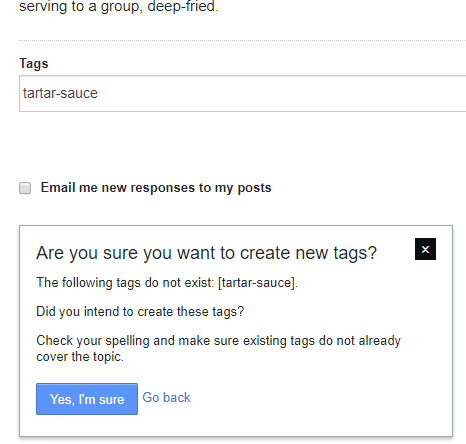 you can repeat from step 5 leading to new calls to /post/new-tags-warning but no warning is ever shown. The expected behavior is of course to show the warning that is returned from the server so the user knows why their question isn't posted. I initially repro-ed this in Chrome/Win10 and I verified this behavior on Edge as well. I didn't bother with Firefox (but @Machavity did). Not the answer you're looking for? Browse other questions tagged bug status-completed asking-questions error-message popup .